It marks the Indian startup's first partnership with a bedbank company. 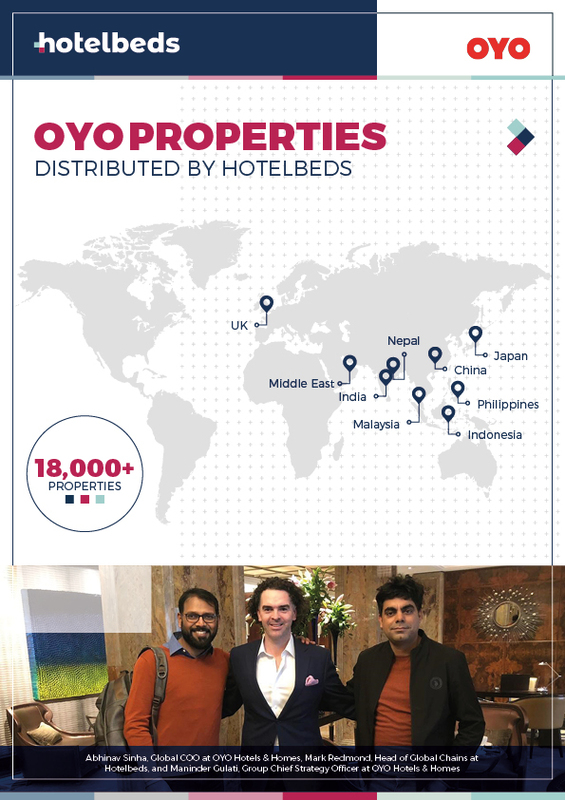 Hotelbeds and OYO Hotels & Homes announced a strategic global distribution partnership. The preferred agreement represents OYO’s first-ever distribution partnership with a bedbank. Through this partnership, OYO will be able to distribute its hotel rooms via both the wholesale channel, which operates under the ‘Hotelbeds’ name and the retail travel agent channel, which operates under the ‘Bedsonline’ brand – all united under one contract. "OYO Hotels & Homes is one of the most talked about hotel brands currently and is massively shaking up the entire sector." Mark Redmond, Head of Global Chains at Hotelbeds, said, “Whilst they currently have an impressive 515,000 rooms, they’re set to increase up to 1 million by the end of the year and we’re looking forward to helping them find incremental and higher-yielding bookings for many of those rooms”. A global-first, OYO Hotels brings a unique equilibrium between demand and supply gap of quality living spaces through proprietary technology, efficient operations, staff training, civil transformation, inventory management, revenue management, and customer relationship manager. All these facets come together to improve a hotel’s performance by delivering a quality-assured experience. Subsequently, hoteliers can take advantage of the technology to boost occupancy and deliver enhanced customer experience. In October last year, Hotelbeds announced the consolidation of all of its brands in the wholesale channel —GTA, Tourico Holidays and Hotelbeds— under the name of Hotelbeds, phasing out the Tourico Holidays and GTA brands. With this, Hotelbeds Group and its wholesale brand are now simply known as 'Hotelbeds'.